SCADA (Supervisory Control and Data Acquisition) systems are at the heart of the modern industrial enterprise ranging from mining plants, water and electrical utility installations to oil and gas plants. In a market that is crowded with high-level monographs and reference guides, more practical information for professional engineers is required. 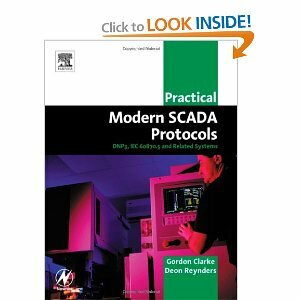 This book covers the essentials of SCADA communication systems focussing on DNP3, the IEC 60870.5 standard and other new developments in this area. It commences with a brief review of the fundamentals of SCADA systems' hardware, software and the communications systems (such as RS-232, RS-485, Ethernet and TCP/IP) that connect the SCADA Modules together. A solid review is then done on the DNP3 and IEC 60870.5 protocols where its features, message structure, practical benefits and applications are discussed. This book provides you with the knowledge to design your next SCADA system more effectively with a focus on using the latest communications technologies available. * Extremely timely subject as the industry has made a strong movement towards standard protocols in modern SCADA communications systems. CLICK ON THIS LINK FOR FREE EBOOK PDF DOWNLOAD!! !